Ten days ago when Ipsos MORI had Yes on 31% and No on 59%, lots of Yes campaigners were a bit disheartened, while Better Together were celebrating. Today the roles are reversed because Panelbase have published a poll where the split is 36% vs. 44%. What’s going on here? Surely 15% of the Scottish public didn’t get convinced by the Yes campaign in just ten days?!? 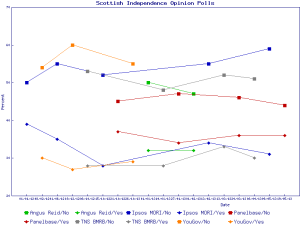 To find out, I plotted the recent opinion polls, divided by pollster (see the graph above). Ipsos MORI’s polls are displayed in blue, and Panelbase’s are in red. 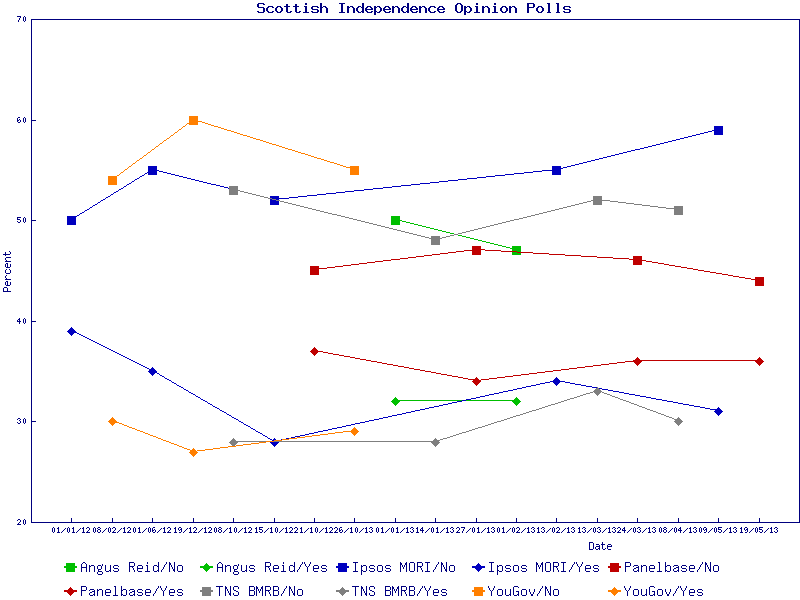 It’s clear that Ipsos MORI are consistently finding many more No voters than any other polling company. Interestingly, they find the same amount of Yes voters as everybody else, so they must somehow get more undecided voters to come out as No voters than the the other pollsters. Panelbase are also clearly finding more Yes voters than anybody else. It’s worth pointing out at this point that we don’t know who’s right. We can’t assume the average is correct — for all we know, even Panelbase might be underestimating the number of Yes voters. Because there has never been a referendum on Scottish independence before, we just have no empirical way to rate the different methodologies employed by the polling companies. After the actual referendum has taken place, we’ll be able to rate the different polls, but at the moment it’s a bit of guesswork. Anyway, the real point here is that we shouldn’t compare the last opinion poll (from Panelbase) with the one before that (from Ipsos MORI), because the systematic difference between the pollsters is far greater than the actual poll movements. It’s a much better idea to look at each polling company separately. For instance, the last three Panelbase polls had Yes on 34% — 36% — 36%, and No on 47% — 46% — 44%, so there’s been a slow movement from No towards Yes. So when Ipsos MORI publish their next poll, we’ll have to compare it against their previous one, not against Panelbase’s very different figures. I suspect that tried-and-tested-and-refined sampling and extrapolation techniques that have given accurate results for elections are not necessarily valid for this referendum. Exactly. For instance, they have no way of knowing what the turn-out will be (it could be much higher than for a general election). A week before the last Scottish elections the last opinion poll saw SNP 12 points behind labor and talked about them having to create a collation gov, then low and behold SNP win a land slide victory, making every poll taken completely wrong, don’t trust in the law of average’s and we are far from average people.